The view of the city of Sochi from the sea. В моём го́роде мно́го па́рков. There are many parks in my city. Ири́на живёт в го́роде Владивосто́к. Irina lives in the city of Vladivostok. Населе́ние го́рода Со́чи составля́ет 337 947 челове́к. 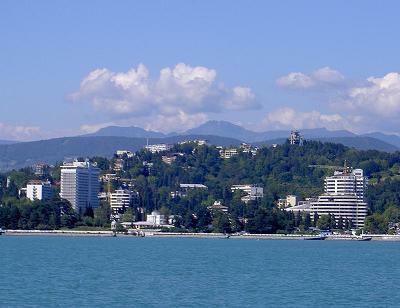 The population of the city of Sochi is 337,947 people. В како́м го́роде роди́лся Пётр Пе́рвый? We are proud of our city. The city turned 100 years old. Го́род располо́жен на берегу́ реки́. The city is situated on the bank of the river. Моя́ сестра́ живёт в це́нтре го́рода. My sister lives in downtown. 2014 Winter Olympics will be held in the city of Sochi. literal Another city -- another temper, another village -- another custom. literal Neither to a village, nor to a city. literal Courage conquers the cities.